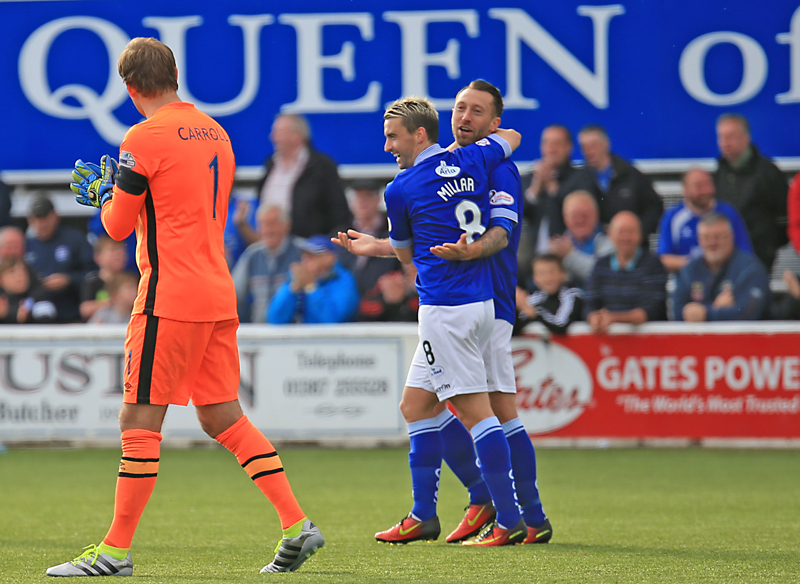 Queens made it through to the last eight of this seasons Irn Bru Cup tournament after an extra time victory over Northern Ireland`s Linfield at Palmerston today. The fact that the game went to extra time was down to some poor finishing by the home side, but mainly due to the performance of Linfield goalkeeper, Roy Carroll, who almost single handedly kept Queens at bay, and in the end it took two excellent goals to eventually find a way past the veteran stopper and secure a way into the next round for Gavin Skelton`s team. The hosts made two changes to the team that began last week in the draw against Dumbarton with Jordan Marshall, and Jake Pickard coming in for Chris Higgins, and Mark Millar. 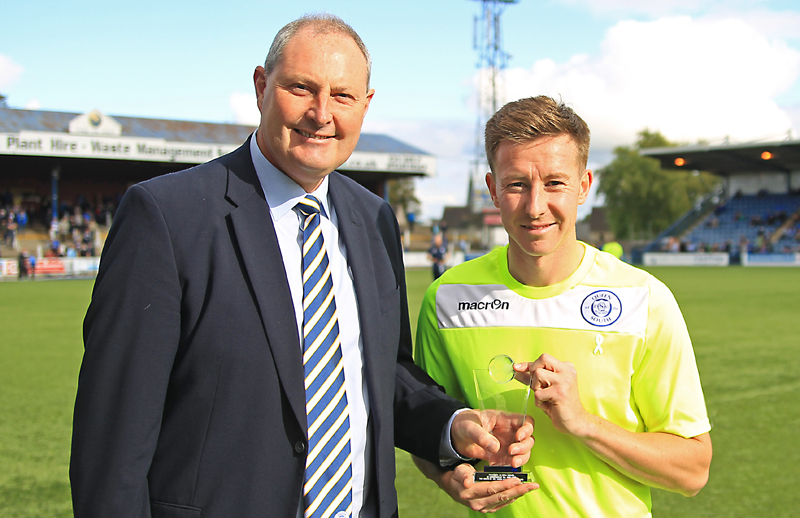 Club captain Chris Higgins made his 200th appearance for Queens in that Dumbarton game and this was recognised by the club before kick-off as he was presented with a memento to mark the occasion. On a more sombre note, a minutes silence was observed before the game began in respect of Linfield fan, Ryan Baird, who was tragically killed in a road accident last week. The game, in front of the BBC ALBA television cameras, began with Queens attacking the very well populated Terregles Street end of the ground and as you would expect after going 3 games without scoring, they were keen to begin the game on the front foot. 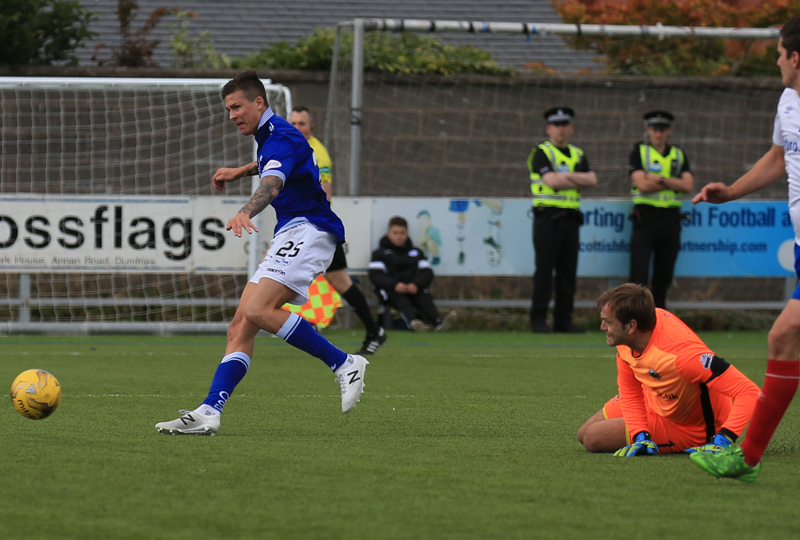 With Steven Rigg and Lyndon Dykes being paired up front, and with both Stephen Dobbie and Grant Anderson operating on either flank, Queens looked well balanced as an attacking force and it came as no surprise to see them have the better of the play from the outset. They created a decent half chance when Marshall`s excellent pass down the left sent Dobbie on a run, but after cutting inside onto his favoured right foot, the striker could only drag his low shot wide of the target. Minutes later Queens had another chance to take the lead when Hamill`s long ball found Dykes in the area and his flick fell to Grant Anderson, and when his shot was blocked straight back into the path of Dykes the Australian could only direct a tame shot straight at the `keeper. As Queens continued to set the early pace on 17 minutes they spurned another good opportunity to go ahead. Following a free-kick on the left, Jake Pickard headed the ball on but unfortunately Steven Rigg could not keep his half volley on target although to be fair it was a difficult chance from a tight angle.Moments later Queens won their first corner of the game and from Marshall`s deep delivery Anderson could only send a header the wrong side of the far post. Little had been seen of the visitors in the way of attacking play and apart from collecting a couple of crosses, Lee Robinson was having a pretty comfortable time, and it was to be from a Linfield cross that Queens created yet another chance. Robinson`s catch and then distribution found Rigg on the right and after working the space for a cross, the striker found Dobbie unmarked in front of goal but there was just a bit too much pace on Rigg`s cross and Dobbie couldn`t keep his volley low enough to count. It was Dobbie again who almost put Queens ahead as out of nothing he managed to work an opening for himself, this time his effort flashed marginally wide of the target, and there was the sense that maybe it was going to be one of those days when Dobbie`s next attempt was brilliantly kept out by Carroll who then somehow got in the way of Rigg`s follow up effort to keep the scoresheet blank. Queens were forced into making a change just before the break when Kyle Jacobs was replaced by Mark Millar - presumably it was injury based as up until that point Jacobs was putting in a decent shift, and on 39 minutes the entire crowd of 2358 joined in with a round of applause for the aforementioned Linfield fan, Ryan Baird. With the interval fast approaching, both teams had good opportunities to take the lead. Firstly Andy Dowie went close with a header following a Mark Millar corner, and then after spaces appeared in the Queens defence for the first time in the game, Waterworth had a golden opportunity with just Robinson to beat, but he completely missed the ball and Queens had themselves a big slice of luck, and when the whistle went to signal the end of the first forty-five minutes,it meant that Queens had failed to find the net in the first half for the fifth game in a row. There were no changes made to either side at the interval, and although the teams had changed around, there was no change in the way the game was played as the home side continued to make the running, and it was the normally reliable Stephen Dobbie who spurned the first decent chance of the second period.Dykes and Rigg combined well and when the ball was played into Pickard his neat pass set up Dobbie who surprisingly hit the side netting from close range. Continuing to have the bulk of possession, Queens were also carving out plenty of opportunities and headers from both Anderson, and then Dykes were both wide of the target. Anderson was replaced by Dean Brotherston in a straight swap and almost immediately Queens passed up another chance when Dowie`s header from a Hamill set-piece delivery flashed wide of the post. The next chance was all down to the persistence of Lyndon Dykes. After pressurising, and then winning the ball from a Linfield defender, Dykes found himself one on one with `keeper Carroll, but once again the experienced Carroll was the master of the situation and saved well to leave Dykes and the Queens support feeling frustrated once again.A moment of magic from Dobbie saw him try to weave his way through several defenders before he was crudely upended 30 yards from goal. With the free-kick being given and the position being pretty central, a direct shot at goal was the obvious solution, and when Dobbie stepped forward to take the kick you could almost imagine the ball flying beyond Carroll, but unfortunately Dobbie`s effort smashed into the wall and although the rebound fell kindly for Dobbie, his follow up effort on the half volley ended up in the terracing behind the goal. The visitors offered little up front but all the time that the game was still level it only needed a set-piece or a piece of class to make the breakthrough and after winning a corner a header from Burns didn`t end up being so far wide.The away side were denied what looked to be a certain goal when Dowie produced an excellent block challenge to keep out a shot from Millar. His namesake, Queens` Mark created a chance for himself but after good approach work his final shot - way over the bar - let him down. Roy Carroll was certainly keeping his team in the contest and as the game entered it`s final stages, the big `keeper produced two top quality saves in the same move to prevent Queens from finding what would have been a deserved lead as he denied Dykes, and then Dobbie saves that would mean that the game would move into extra time. With plenty of effort having gone into the previous 90 minutes play it was clear that both sets of players were struggling to keep up the energy levels but it did appear that Queens did have a bit more left in their collective tanks than their visitors, and Lyndon Dykes - who never stopped running - almost found the breakthrough when his flicked header from Dobbie`s cross had Carroll looking on anxiously. Although many players performed well for Queens it was fitting that arguably the two best on the day combined to finally break the deadlock. 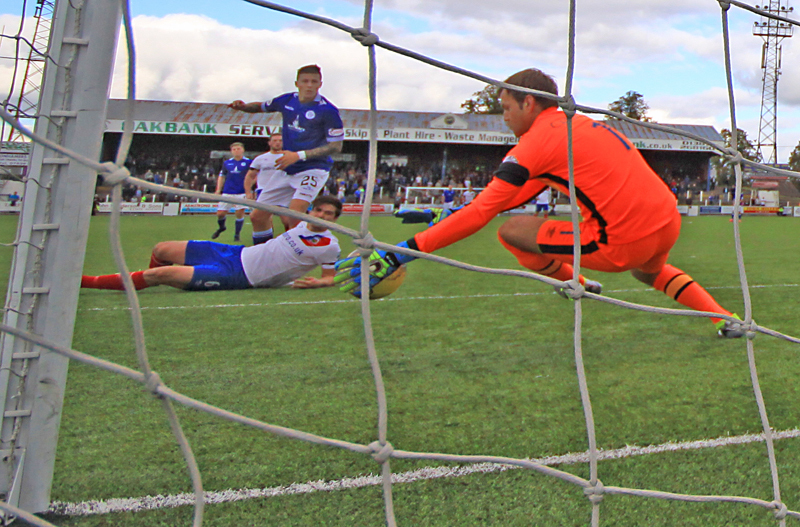 Stephen Dobbie`s delightfully weighted pass into Lyndon Dykes gave him the chance to finally beat Carroll which he did as he rounded the `keeper and slid the ball into the open net to give Queens a lead they more than merited.The Australian was cautioned minutes later for a late challenge on Callacher as the first half of extra time drew to a close. Queens made their final change at the start of the second period of extra time as young Dean Moxon replaced the tiring Steven Rigg- who had worked tirelessly up front alongside Dykes. 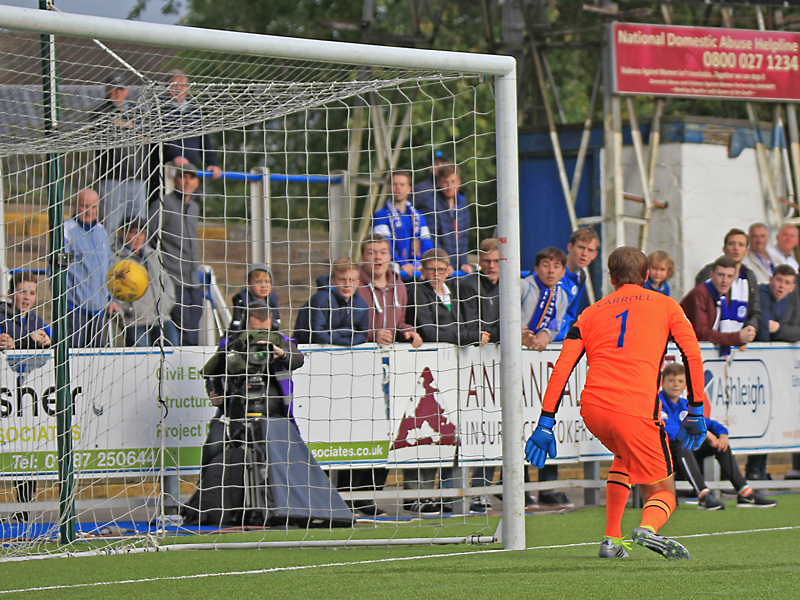 For the first time in the contest the visitors had to open up and try to find an equaliser which led to Queens being able to exploit the extra spaces left by Linfield`s attempt to attack, and any chance of them taking the game to penalty kicks was ended with 11 minutes left as Queens sealed the game with a stunning goal. Earlier in the contest Queens and in particular Dobbie had a decent chance from a free-kick some 30-yards out to score the games opening goal, well from virtually the same position,the chance arose again. 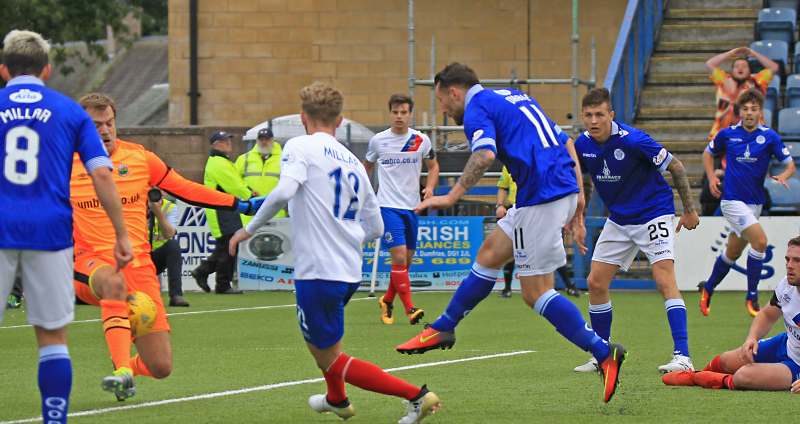 This time `keeper Carroll stood motionless as Stephen Dobbie stepped up and curled a superb effort into the top corner to make sure of Queens` place in the Quarter-Finals and to finally end the stubborn resistance of the side from Northern Ireland. Queens were worthy winners and apart from some wasteful finishing, and finding the visiting `keeper in excellent form, the result should really have been settled long before the game moved into it`s extra period. 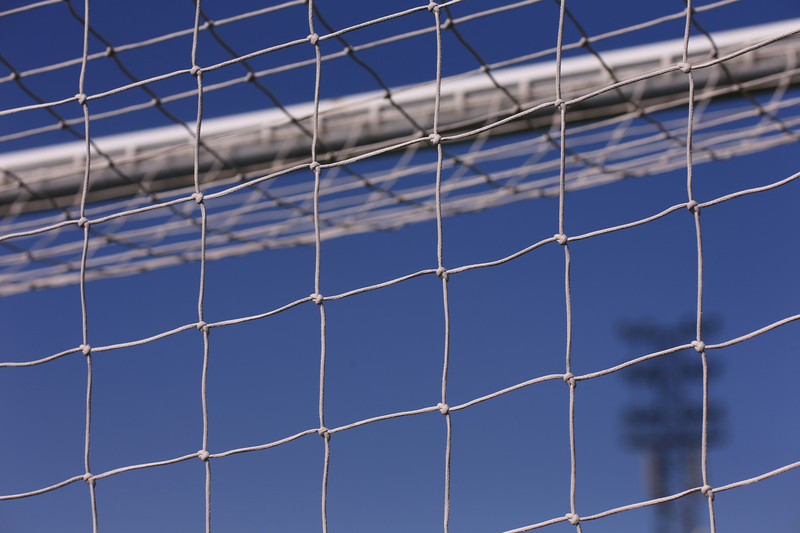 12:26 Update from the manager- No fresh injury concerns in the squad for today`s clash with Linfield. 12:27 Linfield Xi; Carroll (GK), Haughey, Callacher, Waterworth, Millar, Burns, Clarke, Casement, Mulgrew, Carson. 12:32 Subs; Moore, Stafford, Ward, Fallon, Glendinning, Quinn, Strain. 12:53 There will be a minutes silence before kick-off for Linfield supporter Ryan Baird, who was tragically killed in a road accident last week. 12:59 The team`s are out and we are fast approaching kick-off. 4 min Hamill`s free-kick is easily gathered by Roy Carroll. 9 min Dobbie sprints with the ball on the left, cuts inside but his low effort drags wide. Still 0-0 here. 10 min Remember today`s game is live on BBC Alba. 11 min Anderson`s shot is blocked, falls to Dykes but his shot is saved by Carroll. 16 min Rigg turns his marker but volleys wide. 18 min His deep corner is met by Anderson but can`t trouble the goalkeeper with his effort. 19 min Rigg`s cross from the right flies straight to Dobbie but his volley is inches over the bar. 26 min Dobbie collects the ball on the edge of the box and unleashes a fierce effort just wide. 28 min Dobbie`s shot is palmed away by Carroll, and the `keeper makes another save from Rigg. 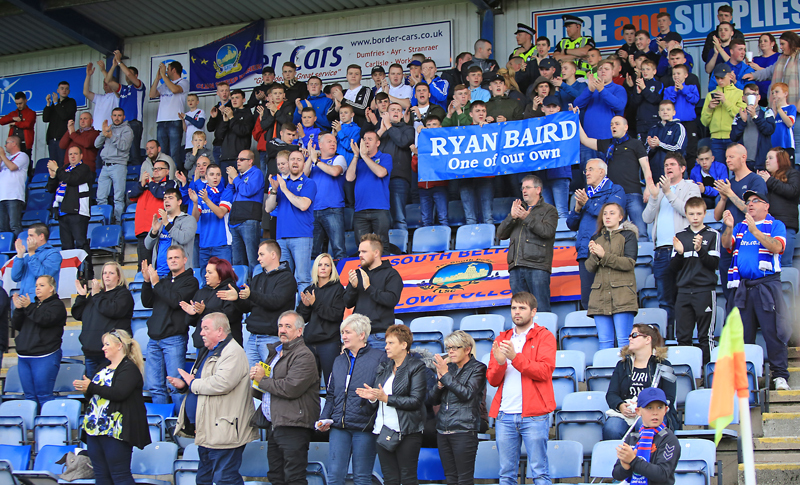 39 min Both sets of supporters conduct a minute`s applause in memory of Ryan Baird. 39 min Dowie`s header goes over the bar for a goal-kick. 41 min Waterworth is playing through but he fluffs his lines and misses the ball. 44 min Millar`s cross is gathered by Robinson. Half Time Today`s official attendance- 2358. 47 min Pickard plays to Dobbie but his shot hits the side netting. 52 min Dykes meets Hamill`s delivery but sends his header wide. Still 0-0 here. 59 min Haughley brings down Rigg. Free-kick to Queens, Hamill to take. 59 min Dowie`s header flashes past the post. 61 min Dykes wins the ball off a defender but hits his shot straight at Carroll. 64 min Dobbie`s free-kick hits the wall, rebounds back to him and hits a fierce shot over the bar. 76 min Millar fires a shot over the woodwork. Still 0-0 here. 79 min Dykes beats Callacher but Carroll saves. The keeper produces another superb save to deny Dobbie. Still 0-0. 83 min Dobbie`s effort flashes past the post. 90 min Three added minutes here. 90+1 min Carroll comfortably saves Rigg`s header. 14:58 Extra-time is just about to begin. Can Queens find a way through Linfield goalkeeper Roy Carroll and make the Quarter-Finals? 95 min Dykes heads a Dobbie cross over the bar. 103 min Dobbie plays an intelligent through ball to Dykes who rounds the keeper and slots home. 1-0 Queens. 103 min Dobbie fires a strike high over the bar and into the travelling support. Half Time in Extra Time Dykes cautioned for a late challenge on Callacher. 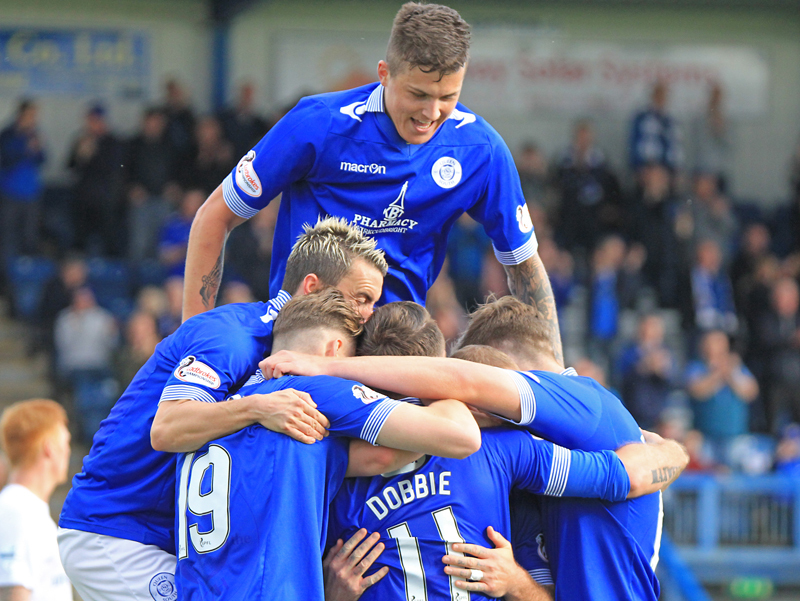 Half Time in Extra Time What a free-kick from Stephen Dobbie. 15:32 Queens are through to the Quarter-Finals of the Irn-Bru Cup after a 2-0 win over Linfield.